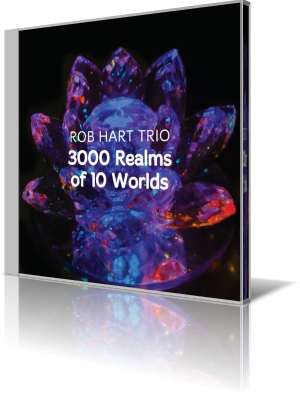 3000 Realms of 10 Worlds (2013) by the Rob Hart Trio is an exploration of different types of music from diverse cultures. The songs were recorded with a trio, with layers or additional musicians added. Hart plays drums and other percussion instruments. However, to call this project a trio may be a bit misleading. The tracks that have only three musicians don’t have the same three. Several songs have up to five musicians. The 16-track set includes six short pieces titled, “Revenge of Waldo,” identified numerically. “Balumania Astria” is seasoned with salsa. Hart handles drums and percussion, with assistance from Greg Sankovich, keyboards; Sheilani Alix, vocals; Jason Muscat, six-string bass; and Karl Perazzo, congas. The result is a tranquil, yet energetic piece that’s enhanced by Alix’s wordless chant and Sankovich’s play on the piano. Pianist Eric Levy carries most of the load for the cover of the Beatles’ “I Will.” Hart’s arrangement gives this song a taste of reggae. Glen Berger contributes with flutes. A highlight comes about four and a half minutes in when piano, flute and bass play a tightly syncopated tutti (multiple instruments playing the same notes) with Hart and Perazzo providing subtle punctuation. Hart, a San Francisco Bay Area native and Berklee College of Music graduate has performed or recorded with the Isley Brothers, David Mann, Larry Grenadier, Mark Van Wageningen and others. And he has opened for Bennie Maupin and Spyro Gyra. Drummer-led sessions often focus on the leader, particularly with small ensembles. However, Hart adeptly does his thing in the background, letting his writing, arrangements and bandmates do most of the speaking.